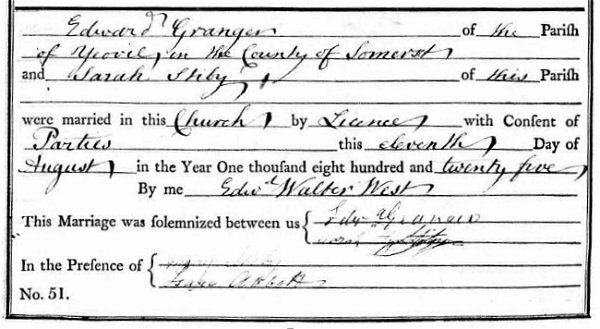 Edward Granger was born at Bradford Abbas, Dorset, just to the south of Yeovil, around 1795 and was baptised at St Mary the Virgin church, Bradford Abbas, on 5 January 1796. He was the son of George Granger (b1768) and Mary née Abbott (b1773). Nothing is known of Edward's early life, but an indenture in my collection dated 18 April 1823 shows that Edward was practising as a 'druggist' at this date. The indenture was for the lease of a property in High Street, actually in the Borough. The indenture notes that the property in question, owned by the Corporation (certainly since 1782) was "All that Messuage or Burgage with its Appurtenances Situate lying and being in High Street within the Borough of Yeovil on the West side of Mr Penny's House and which said Burgage was then lately in the possession of Robert Helliar Deceased afterwards of Benjamin Dymond and then of the said Henry Donn his Tenant or Tenants.... Elizabeth Boucher William Kitson (both since deceased) and John Newman son of John Newman of Barwick". By 1815 the occupier was John Latimer Morton (I have in my collection an indenture dated 8 August 1815 transferring the lease to Morton by the Portreeve, George Wellington, and the Burgesses of Yeovil. Morton died in Yeovil the following year). On 11 August 1825 at Bradford Abbas Edward married Sarah Stiby (1795-c1867), the daughter of Robert Stiby (1749-1819) and Ursula née Abbott (1762-1826). Edward and Sarah were to have two children; Ursula Abbott (1826-1906) and William Slocombe (1836-1908). Edward served as one of the two Churchwardens of St John's church from 1828 until 1830 after which he became a member of Yeovil's Vestry. In its edition of 1830 Pigot's Directory also noted that Edward was the local agent of the Protector Fire Insurance Company and was located in the Borough. His primary occupation however was as a chemist and druggist. Edward, as most chemists of his time, made a range of cure-all pills, lotions and the like - shown in the gallery below are various advertisements for his Balsamic Cough Pills, Antibilious Aperient Family Pills, his Vegetable Tooth Powder (an "efficacious and elegant preparation" for preserving the Teeth) and his 'Specific Drops'. From another indenture in my collection dated 25 March 1834 it is known that from this date Edward leased a Corporation property (shown on the map below, opposite the Mermaid Hotel in High Street) from the Portreeve, Robert Jennings, and the Burgesses of Yeovil. It was from these premises which had previously been the Fleur de Lys inn (shown in the gallery below) that Edward conducted his business as a 'Chymist & Druggist' until his retirement. The lease was for "Four Score and nineteen Years" on the life of Edward's daughter Ursula, in reversion of John Newman and Edward Granger. The rent was 14s 8d per annum with a fine (a premium) of £110 (a little under £10,000 at today's value). This was a year before Jennings sold all the Corporation's properties that were valued at over £25,000 (about £19 million at today's value) to his son for just £2,610 (just under £2 million at today's value) although the sale was eventually vetoed by two burgesses. By 1835 Edward was appointed an agent for JT Betts & Co's celebrated French brandy for Yeovil and the vicinity. In the 1841 census Edward and Sarah were living above the High Street premises with their five year old son William, a chemist's assistant, a chemist's apprentice and a female servant. Edward gave his occupation as a chemist. By the time of the 1851 census 53-year old Edward had retired and had moved back to Bradford Abbas. He continued, however, to manufacture, advertise and sell his various pills and potions. By 1861 Edward had moved his family back to Yeovil and he was living in Kingston with Sarah and son William. Edward's occupation listed in the census is interesting - "Retired Chemist. Surgeon. Member Royal College of Surgeons, England, Licentiate Apothecaries Company". There is, as far as I can find, no other mention in the records of Edward practicing as a surgeon. Sarah died in 1867 and was buried at Bradford Abbas on 7 February 1867. She was aged 71. By 1870 Edward had moved yet again and was living in Peter Street, Yeovil. He died on 9 December 1870, aged 75 and was buried at Bradford Abbas on 15 December 1870. Edward Granger's seal and signature on the indenture dated 25 March 1834. A section of John Martin's 1813 map of the properties owned by the Yeovil Corporation (shown blacked-in). The first property leased by Edward was in the Borough on the south side (the blacked-in property beneath the 'O' in the word Borough) "on the West side of Mr Penny's House". The second property Edward leased was that blacked-in property shown at farthest left, opposite the Mermaid Inn. The record of Edward Granger's baptism, dated 5 January 1796, from the Bradford Abbas parish register. Was he the twin of George? or were the two brothers simply baptised on the same day? The record of Edward and Sarah's marriage by license on 11 August 1825, again from the Bradford Abbas parish register. 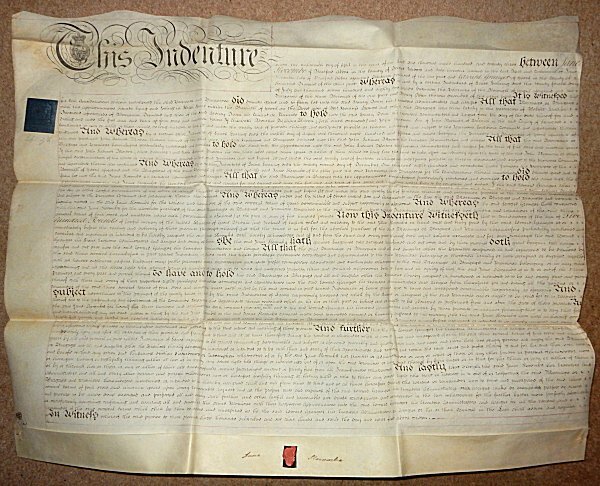 This indenture is dated 18 April 1823 and shows that Edward was practising as a 'druggist' at this date. The indenture was for the lease of a Corporation-owned property in High Street. 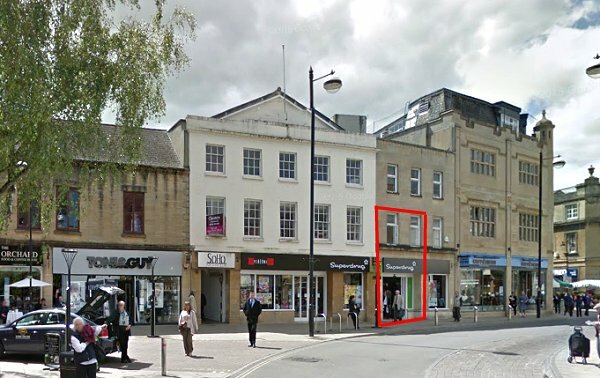 The property was in the Borough on the site currently occupied by part of Superdrug between the main 5-bay Superdrug premises and Cafe Nero - shown outlined in red in the photo below. 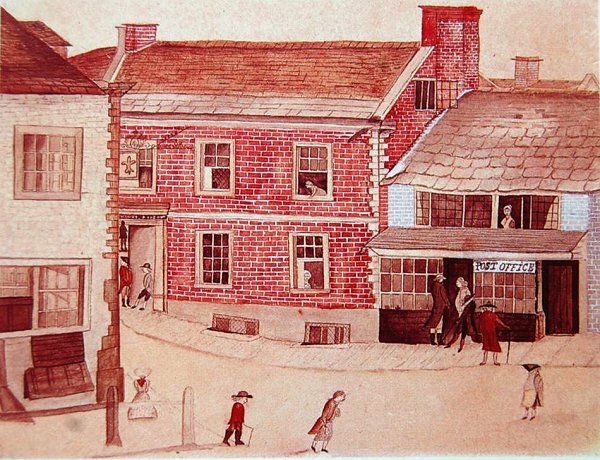 The red outline in this photograph indicates the location of Edward Granger's first premises in the Borough, from 1823, before moving to premises opposite the Mermaid Inn in 1834. In 1823 the imposing Superdrug building at the centre of this photograph would already have existed for some forty years but all other buildings from that time have since been demolished and replaced. 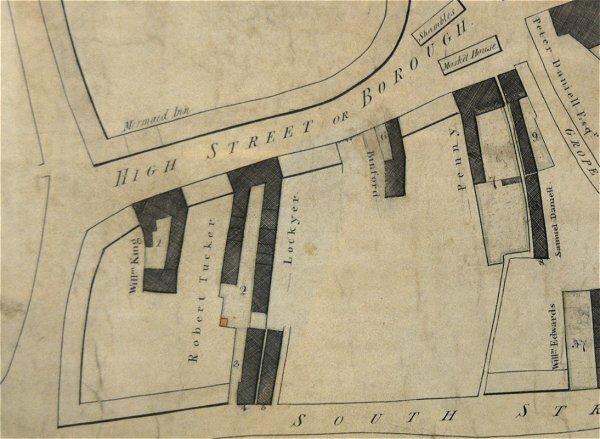 This sketch, made by GE Madeley to illustrate his map of 1831, shows the Borough seen from High Street - roughly the view seen today from the north end of King George Street. The Shambles is to the left and the Market House is to the right. The buildings at far left still stand today, that to the left is Clement White's shop, today's 8 High Street, at this time occupied by draper Benjamin Ryall whose name appears above the door. Behind the Market House and the hanging sign at right is the predecessor to the Medical Hall, which at this time was occupied by George Wellington, druggist and chemist. The sign affixed to the wall at right reads "Granger Chemist Druggist" and is on the side wall of Granger's shop described above. Edward, as most chemists of his time, made a range of cure-all pills, lotions and the like - here advertised are his Balsamic Cough Pills, Antibilious Aperient Family Pills and his Vegetable Tooth Powder. 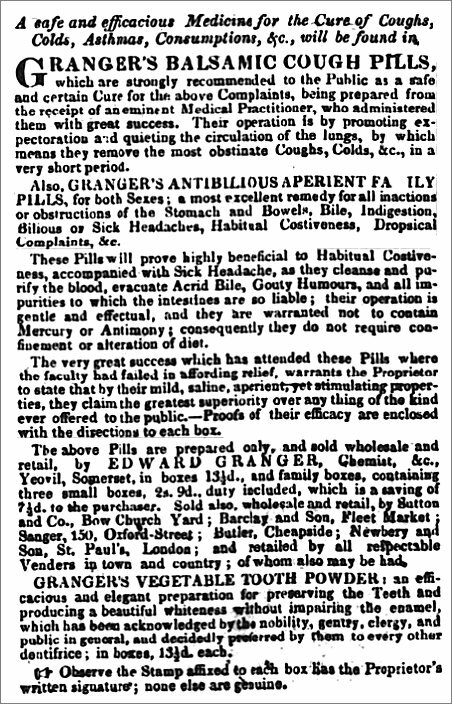 This advertisement appeared in the Dorset County Chronicle and Somersetshire Gazette's edition of 14 April 1831 but Edward continued regularly advertising his medicines well into his retirement around 1850. 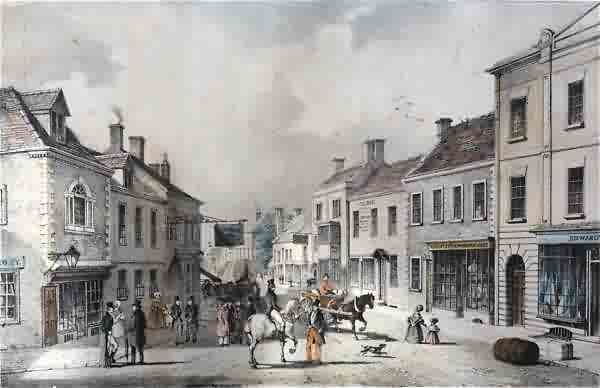 This painting shows, at right, Yeovil's first Post Office in High Street (replaced by Linsey Denner's shop in 1836), at centre is the Fleur-de-Lys Inn. The painting has been dated to between 1766 and 1780. By 1813, if not earlier, the Fleur de Lys building was owned by the Corporation and is shown on John Martin's map of the properties owned by the Yeovil Corporation (see above). 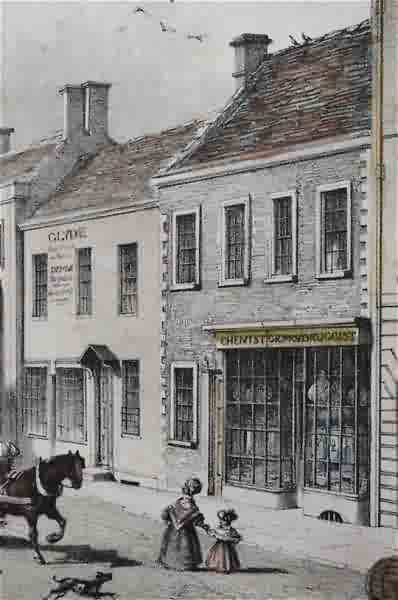 The Fleur de Lys building became Edward Granger's chemist & druggist shop, as seen in the next image, in 1834. The building would revert to a pub called the Fleur de Lys around 1880. This lithograph looks down High Street from its junction with Hendford / Princes Street. On the left the Mermaid with its familiar archway and large overhanging sign is clearly seen. On the opposite side of the road, just right of centre, the white three storey building with the two-storey projecting bay is the Kings Head Inn. It is likely that the two storey building next to the Kings Head Inn is the building that held the former George Inn. This hand-tinted stone lithograph was by Henry Burn (1807-1884) entitled 'Market Place - Yeovil'. There are not many known stone lithographs by Henry Burn because he left for Australia in 1852. It was published by William Porter and Henry Marsh Custard in January 1839 and printed by Charles Joseph Hullmandel (1789-1850) of London, where he maintained a lithographic establishment on Great Marlborough Street from about 1819 until his death. At extreme right the three-storey building just glimpsed is the newly-built premises of the draper's business, Edwards & Dean, later of draper Linsey Denner (today's Beale's store) which replaced the early Post Office of the previous image. Next to it the former Fleur de Lys, with a re-styled large shop window, is the Corporation-owned premises which by this time were occupied by Edward Granger, Chemist and Druggist. For a more detailed account of the buildings in this 1839 lithograph, click here. 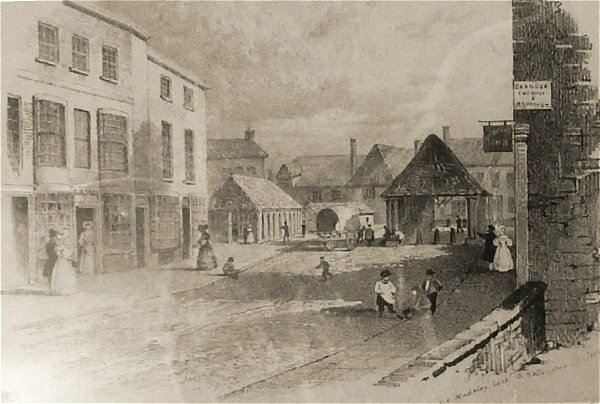 Enlarged from the lithograph above, the building at right, a property belonging to the Corporation, was the chemist and druggist premises of Edward Granger and the large glass vessels that were the distinctive sign of his trade are clearly seen in the shop windows. Both before and after this lithograph, this building was the Fleur-de-Lys, today it survives (albeit altered) as part of Beales' store. Granger rented the building from 1834 until he retired around 1850. 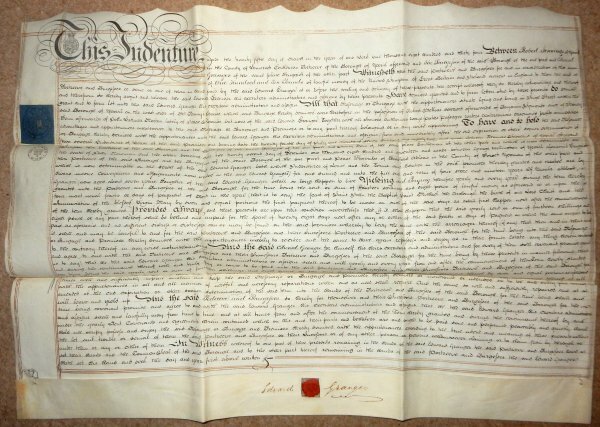 The indenture, dated 25 March 1834, in which Edward Granger leased the High Street property from Robert Jennings, Portreeve of the Corporation at the time. An advertisement from the 26 March 1835 edition of the Dorset County Chronicle of the appointment of Edward as the sole agent for Betts' French brandy. At this time Edward's premises were in the Borough. Another advertisement for one of Edward's cure-alls - this from the 19 December 1844 edition of the Dorset County Chronicle.